Flagship was originally a naval term referring to the lead ship in an armada, usually carrying the admiral or flag officer, but over the years it has come to mean the best or most important product produced by a manufacturer, to which the Lexus Ls is no exception. When the Lexus LS came out in 1989, it established a number of industry firsts. The fifth generation LS returns this year with over 15 more premiere industrial innovations, fulfilling its role as the Lexus Flagship well beyond expectations. Over the model’s lifetime, it has introduced innovations such as the inaugural 8-speed automatic transmission, low beam LED headlamps, climate control utilizing infrared sensors, the very first V8 all-wheel-drive hybrid and was the first car that could parallel park automatically. This year a five-mode drive selector, optional all LED headlamps, adaptive shocks, air channeled wheels, improved body bonding via laser welds, additional chassis bracing and artifices in the front grill louvers to correctly direct the airflow have been added – not to mention the exhilarating F-Sports models. We decided to follow up on this theme with Smith last week, regarding the role a flagship plays for a premium brand such as Lexus, during the media ride and drive introduction of the new Lexus LS models. “Well I think, especially in our case, LS is not just a flagship,” Smith said. “It plays an important role because it was the first vehicle that really launched the Lexus line. So for us, we’ve always said it needs to be the first to introduce technology for us and continue to be that aspirational vehicle. “When we first started, most of the people who bought a Lexus were coming in from other luxury brands,” he continued. 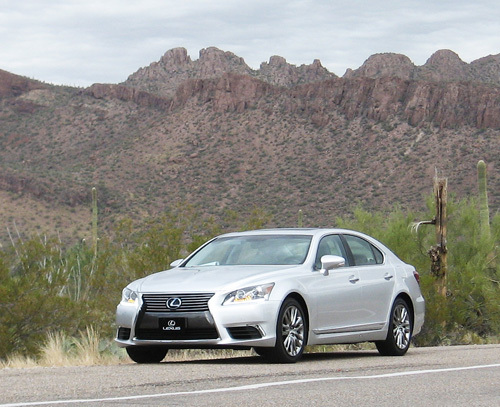 “Today we enjoy this huge owner loyalty rate and many have bought other Lexus vehicles, but those who come into the brand are looking at the LS as a really premier vehicle they can work up to and that’s what the LS has always been. So it is a Flagship and that’s really different than a Halo. So the Lexus LS has traditionally sold enough units to hold it’s own in the Lexus line. Since the first LS came out, Lexus has expanded the line by 70 percent, completing a nice line of premium commuters, sedans, sports sedans, convertibles, SUVs and executive sedans, most with hybrid and many with F-Sport variants. Returning to the role of a flagship, another way to identify a flagship is the brand’s approach to marketing the model. “We put more marketing effort into the LS, considering its sales numbers, than other models in the lineup,” Smith said. This is not necessarily true for other premium brands, lhowever. The one thing Halo and Flagship vehicles share is bringing people into the showroom – it may not be what they ultimately buy, but it’s what makes them want to come in and look. Do only premium brands have flagships? Not necessarily – Smith conceded the Toyota Avalon might be considered a flagship to their sister brand. He also admitted the LS will continue its role as the Lexus Flagship by continuing to offer technological firsts and remaining at the cutting-edge of innovation. That’s the name of the game. So if you’re driving a flagship from Lexus or any other brand, you’re not riding with the king, you’re cruisin’ with the admiralty. If it’s anything like the new Lexus LS, it’s going to be one sweet ride.